The Pier by Crate Paper is a great choice for summery or beachy layouts! Check out the challenge going on now at the Crate Paper blog for a chance to win the entire collection! 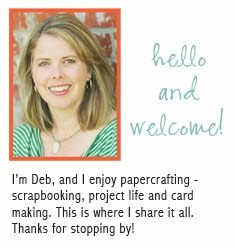 oh Deb....sigh....I just adore all your work....thank you for the inspiration....I am off to scrap now! this is so amazing Deb!!! gorgeous!! This is so fun!! Love all the amazing colors & layers you've added to it! really cute! hope i get to crop with you soon! are you going to TAc, GGC or SF? Love this! Love this C p line so much! This is one of my favorite lines right now and you are really showing it off. Makes me want to go get out some of my Pier goodies and play. Love your layout - all the great colors and the line of CP ist absolutly phantastic! I am loving this line too. Bought a lot and got a lot for scrap work. You did awesome, Deb! I see your style defining more! happy NSD and a layout!